For children, the world is their playground. Their imagination knows no boundaries and everything is an adventure waiting to happen. As children develop from the toddler stage to school age and then, the pre-teen years, it is a great time to expose them to various learning opportunities through dress up play. Eventually, every child will grow up and follow a career path. If they are exposed to numerous career possibilities through dress up play early, chances of them finding the one that they'll love sooner rather than later are higher. Here are three reasons why dress up play benefits children. A child's imagination runs at what seems like 100 mph. When they get to play dress up, it allows them to further exercise those imagination muscles. Before you know it, they are acting out stories they are making up as they go pulling from their creative side. If they are in a group setting, you will witness each one take a role where one becomes the director and another the lead actor without the aid of a script. Best of all, during this activity, the participants probably will not realize that they are learning through their own creativity. As children get to pick out costumes and accessories, or build make-shift costumes, they are experimenting. When articles of clothing do not fit, they get to figure out what to do next. They have the opportunity to match pieces together and to put together completely new outfits with one single piece like a fireman's hat, science lab coat or ballerina tutu. 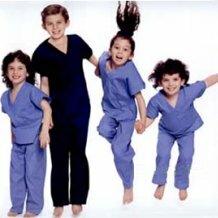 Kids lab coats, for example, can turn that child into a scientist, doctor or bio-engineer in an instant, and you never know, it may be the moment they find their future career. While a world of responsibilities, accountability and decisions awaits every child, during the early years, letting children be children is healthy. Through dress up play children get to have fun by themselves or in a group. The world is their oyster and everything their mind can envision is possible. In a group, they get to share and bounce ideas of each other, and if you decide to play along, you get to be their dress up doll. Either way, fun is had by all. Dress up play benefits children and has a positive impact on their futures.